A perfect blending of smoke, salt, parsley, and garlic that help you understand the wonderful flavor of Santa Maria Tri-Tip. 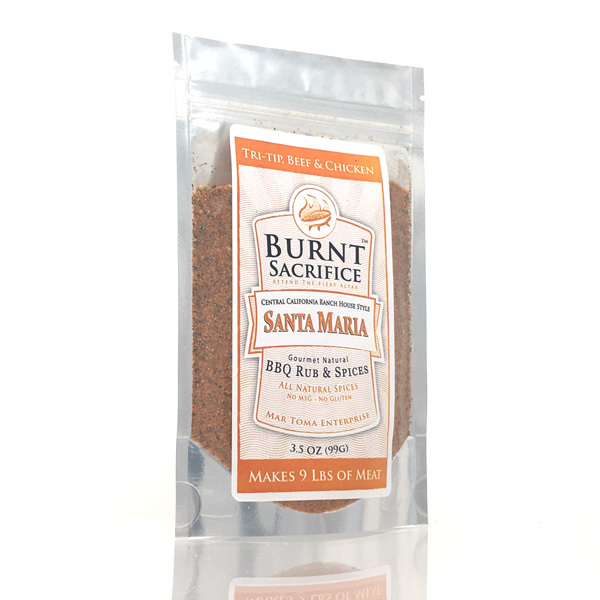 Our Burnt Sacrifice Santa Maria BBQ rub transports you to the stunning ranch house flavors of the central coast of California. Designed for tri-tip and beef roasts, it also works well on brisket and other lean cuts of beef. Don’t forget to try it on chicken, as this special blend will enhance the flavor of just about any type of meat. Close to the garlic capitol of the country and influenced by the old Spanish vaqueros this style blends a strong garlic imprint balanced with wonderful black pepper, paprika, parsley and secret spices. Its got real brown sugar so it will help your meat get some bark, yet isn’t sweet. And there is real hickory smoke for a nice BBQ finish. Even if you are oven baking or cooking on propane. It is tasty but measured in smokiness. On your first bite you will know that you are having a special experience. In the 1950’s, on the Central Coast of California, just about halfway between Silicon Valley and Hollywood, in Santa Maria, a local butcher decided to try a new cut of beef. He decided to try cutting a two to three pound triangle off the top sirloin. Seasoning it with lots of herbs and spices, it was grilled to perfection. The locals snapped it up quickly and Tri-Tip has become one of the most popular cuts of beef in the entire state of California. It is enjoyed for its juicy, tender flavor. In tribute to this innovative butcher in Santa Maria and Americas newest rising regional BBQ style, I designed this rub to bring out the fabulous flavor and juicy tenderness that is Tri-Tip. Staying true to the original. Ranch-style seasonings including real hickory smoke, parsley, garlic, salt, pepper, tarragon, oregano, and brown sugar make this bold and spicy rub perfect for very flavorful steak that can be cooked many different ways. With our Santa Maria Rub, it will be so tender that it will melt in your mouth. Best on: Everything, but specifically designed for beef roasts like tri-tip.